We take care of relationships with every client, their trust and satisfaction, and the only way to achieve that is care for high product quality. 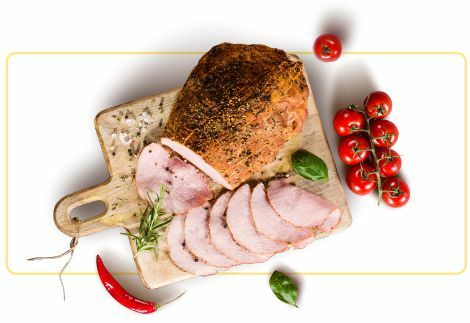 The saga of upper-shelf hams and meat products begins with meat from a tried-and-true slaughterhouse, leads through modern, friendly, and pro-health technologies, and ends on the Customers’ tables. We take care to ensure that our products become exactly like those we would treat our families to – hence the care for the environment, the use of only tried-and-true high-quality meats, and constant development that permits us to maintain close and familiar relationships with our customers. For years, we have been sticking to our family receptures, that, in conjunction with the regional meatmaking tradition, give our products the taste associated with Sunday and festive-day visits to Grandma’s. We channel those pleasant memories to the modern tables, taking you on a trip through the time, bringing you where the atmosphere is familiar and the taste is best. For us, tradition is both a foundation and a starting point. Using it as the base, we create new products that have a common denominator in the form of family breakfasts, lunches and meetings. We aim to creatively develop the best of the traditional with equal attention to family tradition. The recipe for high-quality meat products begins in the place where the meat itself comes from. 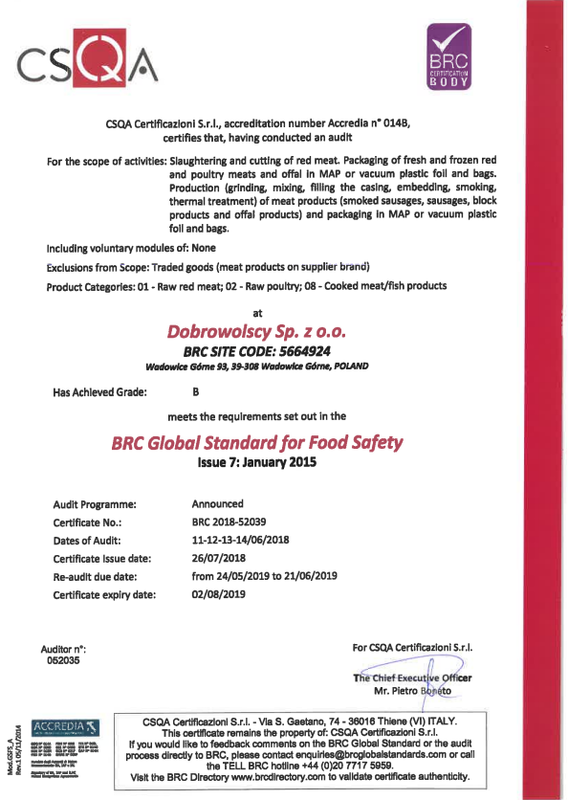 For us, Dobrowolscy, creating products that connect generations through taste is possible only when collaborating with suppliers proven to be good. From the beginning of our company’s existence, we have been investing in pork slaughter and cutting. 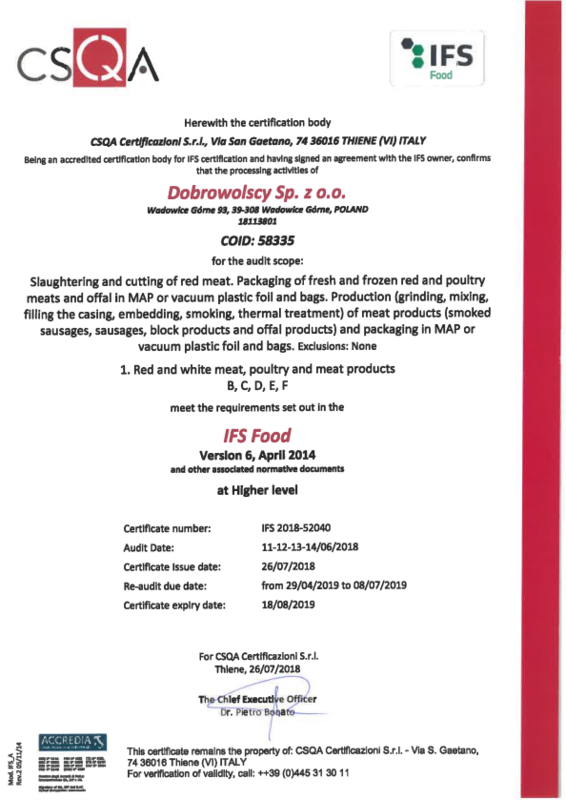 Currently, the company slaughters 15 thousand Polish pigs per month and only collaborates with proven suppliers. This ensures that we supply the customers with products of highest-grade pork. 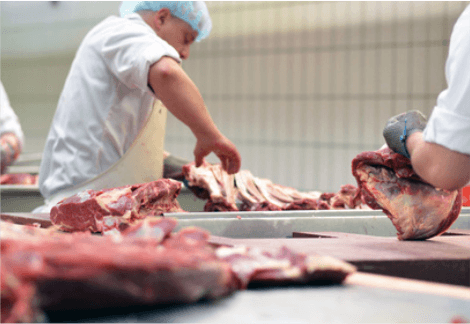 The high-quality meat, along with the newest technological solutions and quality audits serving to constantly improve our products, translate into the fact that we are proud do present our products. The noble and exquisite taste of the hams is owed to high-quality meat and spices assorted in accordance with the family recipes. The spices we use come from proven suppliers as well. We only use high-quality products, with no GMO. The spices are there to give food taste and aroma, with our sensor panel taking care of it. It is to the most subline “noses” that we owe the unique taste of our hams. The plant’s laboratory is at the forefront of caring for the safety of our products. It is made up of a certified microbiological laboratory, a sensor workshop, and the BRC and IFS quality management system. One of the unchanging pillars of our activity is the constant endeavour to raise the quality of our products. This process would not be possible without multi-stage quality control. The first stage are tests performed with our suppliers. Then, the meat meant for processing is tested. The microbiological conditions in our plant are constantly monitored. This is not the end of quality monitoring; subsequently, checks are conducted during the ham production and in sale points. All of the steps taken share a common goal – the certainty that only fresh and healthy products find their way to your table. We would not be sure that our products are quickly and correctly (i.e. in the appropriate temperature) transported to stores and warehouses in the entire country if we did not possess our own fleet of freezer-equipped delivery cars. 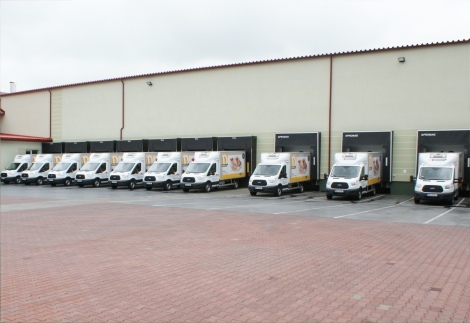 We service 90% of the market with our own fleet, and in the remaining situations, we only collaborate with proven suppliers that also see it to that our products reach their destination quickly and in appropriate conditions.